I feel like Friday’s open rehearsal was 6 months ago and I’m having a tough time focusing at work But if lovely wonderful thoughts lift you up in the air then I can fly! Why do all good things must come to an end? Thank you John Williams. Notes on the program can be found HERE. 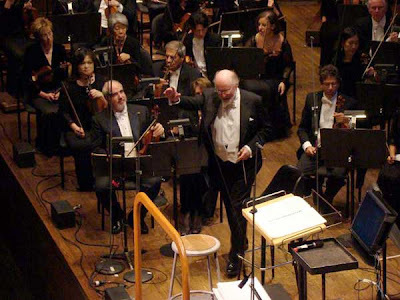 Last night was the first of a series of three concerts by John Williams with the New York Philharmonic returning to Avery Fisher Hall after last year’s great success. Fun was the keyword and it was fairly obvious early on that everybody was just having a good time. 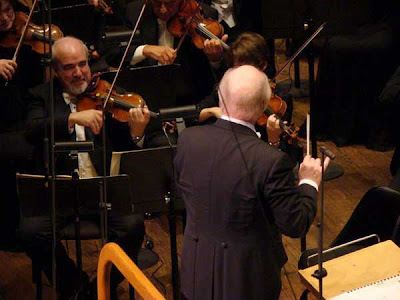 By everybody I mean John Williams, the musicians of the New York Philharmonic, special guest Stanley Donen but also us the audience and what a great audience it was, a bit on the noisy side but very reactive yet considerate. The first half of the concert was all Williams and immediately after walking on stage and briefly greeting the crowd the Maestro starts with Sound the Bells! 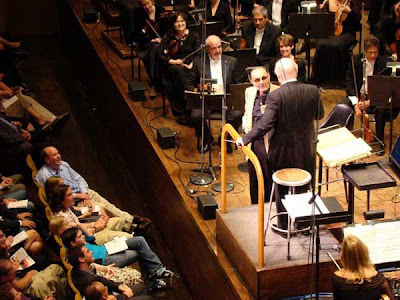 A classic concert opener and a crowd pleaser it’s a piece well suited for the acoustic of Avery Fisher Hall which, as pointed by pi, tends to favor brass and percussions. It sounded to me very similar to the album version heard on “Call of the Champions”. Williams then briefly turned around to acknowledge the applause and then went right into Flight to Neverland. It was my first time hearing this piece in concert (well second if I count the rehearsal this morning) and it was absolutely wonderful. I don’t particularly care for the movie but I do love the score (I have the Concorde 2 CDs version… Can I say that?) and it was beautifully executed by the New York Philharmonic. After much applause and cheers from the audience John Williams picked up the microphone and started talking about the Brontë sisters, their influence on literature and how pleased he was to have been involved with the made for TV movie 1970 version of Jane Eyre. He indicated it would be three separate compositions from the score. This was really a revelation. I admit I’m not excessively familiar with this particular work (I promise to work on that next week) and this was easily the high point of the concert for me. That’s also where the audience showed consideration because you could hear a pin drop during the brief moments of silence between the three pieces. Out of 2,700 people not even one attempted a clap of hand. Magical. Speaking of Magic, I always get the giggles when John Williams speaks geek and he gladly does for two franchises, Star Wars and Harry Potter. To see him on stage very seriously talk about Moguls, wizards, Hogwarts and the likes, always seem to me odd and funny at the same time. I was really having cold sweats on that one because during the rehearsal this was by far where Williams went back to work the most with the Philharmonic and for good reasons. Besides “Aunt Marge’s Waltz” feeling a little rush towards the end I thought it went a lot better than in the morning. After waiting for the roar of the audience to calm down he started to talk about his involvement in Fiddler on the Roof and his work with Jerry Bock’s composition, started to reminisce about his life as a piano player in the 1950s and how his best friend at the Los Angeles Philharmonic was Harold Dicterow, Glenn Dicterow’s father. On a side note: Williams last year never mentioned he knew Glenn Dicterow since the 50s, just that he played violin on the studio recording of Jaws. I thought it went great but then again I didn’t have any significant problems during the rehearsal in the morning either, so I’ll let others be the judge of that. It’s a rollercoaster of a piece and Avery Fisher Hall might not be the best venue for it, because of its quick switches between full orchestra and quiet strings but it’s quick joyful and entertaining and a great way to conclude the first part. The projection screen rolls down during the intermission and just like for the first part, John Williams walks back on stage, salutes the audience and goes right into Hooray for Hollywood. Again a crowd pleaser, great way to start and put everyone in the mood for a tribute to the Films of Stanley Donen. I could swear it sounded exactly and I mean exactly like the “Salute to Hollywood” version. 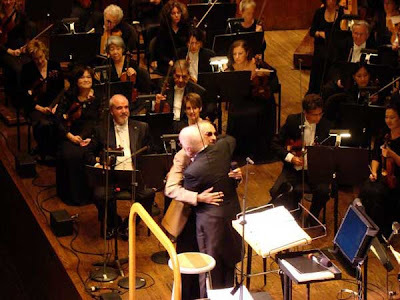 After another round of applause the Maestro picks up the mic and introduces special guest, Director of many of the greatest musicals of all times, Stanley Donen who turned out to be an incredibly entertaining guest. I went through the whole thing during the rehearsal but he was even funnier this time around. Donen: “No, you’re the genius John. I’m just here to try to help you the best I can”. The first piece is You’re All the World to Me from Royal Wedding, where Fred Astaire dances from the floor to the walls and then to the ceiling. Donen goes on to explain with the help of a crude 3D animation (laughter from the crowd) how they built the room in a cylinder and the camera was rotating at the same time as the room. The number starts with the audio from the movie then as we get into the dance part the orchestra picks up. The challenge here is to remain in sync with the movie but after E.T. last year, I believe Williams can keep the Philharmonic in sync with just about anything. Donen introduces next Bless Your Beautiful Hide from “Seven Brides for Seven Brothers” known for this concert thanks to the horrible pan and scan version that was shown as “Four Brides for Four Brothers”. He goes into a colorful story of how the producer of the movie didn’t want dancers (+ expletives) to play outdoorsmen and how he (Donen) asked Deutsch who was doing the orchestration to make DePaul’s score sound like Copeland. Next is I Like Myself from “It’s Always Fair Weather”. Donen starts a fairly long story of how Gene Kelly was such a great roller skater and he always wanted to do a dance number with him on skates. All of a sudden in the middle of the story he says “but I’d better move on because I think we’re running a little long”, Williams reassures him “no it’s quite alright Stanley”. During the introduction of The Worry Song from Anchors Aweigh at the rehearsal I really thought Donen had lost his marbles, because he goes into that whole story about Singin’ in the Rain (the next number) and how it was all about rehearsing preparing and precision and to go back to his original point this dance number with Gene Kelly and Jerry the mouse (an animated character) was all about preparation. He had also a great story on how his original idea was for Kelly to dance with Mickey Mouse and Disney told him in a meeting that Mickey didn’t work for MGM. Finally Singin’ in the Rain. More funny stories about his brilliant idea to have Gene Kelly singing… in the rain. Priceless. All and all this tribute from a musical standpoint might not have been totally satisfying (long introductions and short sets) but the interaction between Williams and Donen made it all worth it and how many more opportunities am I going to have to see Stanley Donen in person? Come on give the man a hug. Now back to Williams work. Sayuri’s Theme from Memoirs of a Geisha. I think the score for Geisha is just OK. I don’t dislike it but I won’t go out of my way to listen to it. As a concert piece I thought it was great I especially liked the intro by Carter Brey going Cello solo. Finally: A Tribute to George Lucas and Steven Spielberg: A musical montage that includes Jaws, Star Wars, Raiders and E.T. It’s fun very dynamic and gets the audience excited and a fine way to end the second part of this concert. First was Sugarland Express very laid back jazzy piece great for calming things down. This was the only encore that was rehearsed in the morning. No harmonica however substituted by a flute but it works just great. Olympic Spirit came second. I thought it was a little pretentious to have an encore with a video montage. Considering the logistics it’s like saying “yes we knew there would be a second encore” but what the hell, he’s John Williams! It was yet another great evening with the Maestro. I can’t believe I’m going back tonight… And tomorrow! I almost fell off my chair this morning. Am I the only one who didn’t notice there was a video at the bottom of the concert page? 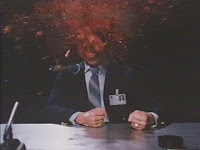 My head is about to explode. I’ve been looking forward to “The Bourne Ultimatum“‘s soundtrack since at least April. As fate would have it, as I’m picking up my copy at the Virgin on Times Square I notice a magnificent Collector’s Edition for the soundtrack of 300. I’m thinking what the hell, it’s only 4 bonus tracks so I can give it a quick spin and still dedicate plenty of time to the latest Bourne score. I’m buying it as well. 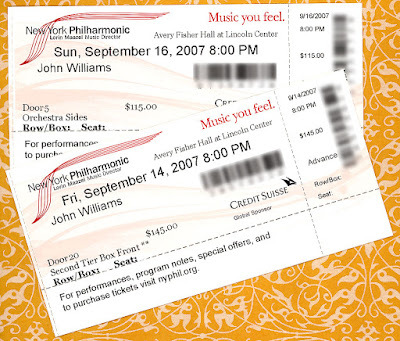 Just got my John Williams concert tickets!